Welcome to BEST HOME DECORATORS! Gorgeous handmade mini baby love seat for children, birthday parties, and even photo props!!! 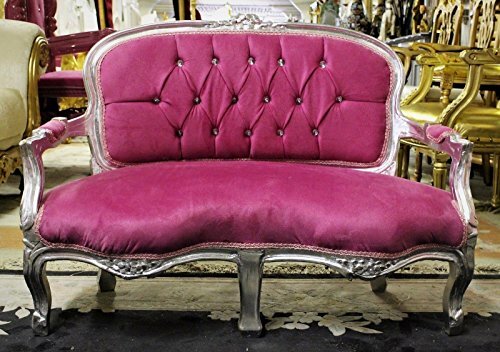 Features premium quality tufted pink velvet upholstery. The frame is hand carved, decorated with silver leaf accents and made of solid wood. This loveseat is for small children or small pets. Overall Dimensions: 28"H, 39"W, 18"D Seat Height: 12" We are a family owned business selling high-end furniture and decorative items for generations. Currently, we operate from our large warehouse, that makes us possible to offer excellent prices. If something caught your eyes from our listings don't hesitate to contact us for further information. We don't have time to post all of our items, but we are happy to post other available items to your liking. We only conduct business through Amazon. You can message us anytime. Our friendly staff is happy to help you. Thanks! Overall Dimensions: 28"H, 39"W, 18"D Seat Height: 12"
Manufacturer: Best Home Decorators Inc. Publisher: Best Home Decorators Inc. Studio: Best Home Decorators Inc. If you have any questions about this product by Throne Kingdom, contact us by completing and submitting the form below. If you are looking for a specif part number, please include it with your message.